Our trip was split into two parts - building classrooms at the school and then, a week long safari. I'd dreamt of going on a safari ever since watching The Lion King (and The Wild Thornberrys) as a kid, so for me it was the perfect treat after helping to build the classrooms. On our days off, most of the group went to the beach. A couple of us spent our free days visiting orphanages and feeding programmes, which were really eye opening. The children at the school were poor, but seeing the children that had lost their parents to HIV, and the very young children who would walk kilometres and kilometres to the feeding programme, with their baby brothers or sister tied to their back so they could take two meals instead of one - that was heartbreaking. I felt that it was important to go and help where possible. At the school, our teams would take it in turns building, or in the classrooms with the children, teaching them to sing songs or helping with their lessons. Nearly five years on and I still get emotional when I hear 'Ain't No Mountain High Enough' as it reminds me of how excited the children were to learn it! Our days in the classroom seemed fly by in a flash of smiles and tears and laughter and singing. I'm yet to meet a group of happier children, which I often reflect on when I think of how little they have. The last day at the school was emotional. We'd gotten to know the kids during our time there, and they were as gutted about us leaving as we were. There were lots of hugs and tears, but at least I knew I'd done a good job in my bricklaying.... Plus it was time for safari! I can promise you that for me there were many, many more excitements to come - mainly in the form of every single animal that happened to wander into my vision. We were lucky enough to see the Big Five during our week in the parks. I will never forget moments such as eating breakfast whilst a family of elephants walked through our campsite, or watching a leopard eating his dinner right next to where we'd just eaten ours at the lodge! My favourite moment was watching a cheetah teaching her cubs to hunt (and then one of them messing up the hunt, so I didn't have to watch any gore.) We were also privileged enough to be invited to meet some of the Maasai Tribe, who put on a singing and dancing display for us. It's safe to say that my time in Kenya was one of the best experiences of my life so far. It's going to take a lot to top it. A huge thanks to Paul Miller for ever allowing me on the trip in the first place, and of course Linda and Mike for all the amazing work they do. 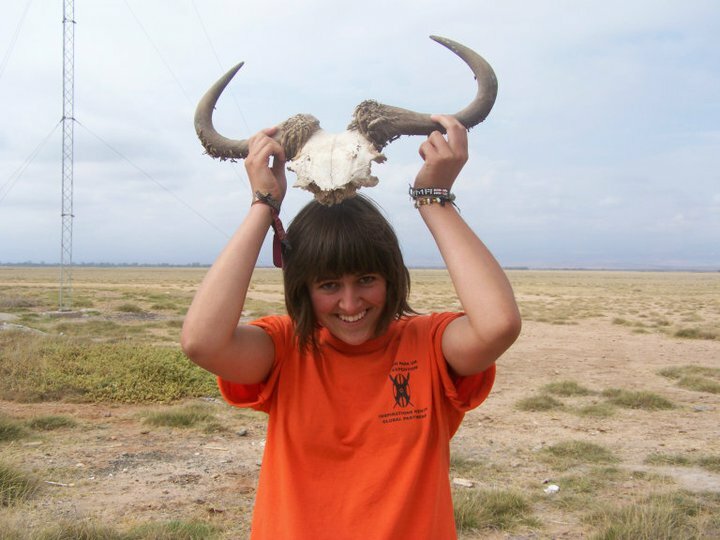 I definitely want to return to Kenya - it really did change my life. Everybody was probably quite happy about this. Trying to be a goat thing. Probably trying to steal a monkey for a pet. Trying to get a kiss from a giraffe.